One thing that surprises me is just how quickly you work (from my outside-looking-in perspective, anyway). So many of your surface textures are just gorgeous. Is all of this just a hobby, or are you a paid graphics artist as well? While high quality like all of your work, the inner square is such that it looks less like a flat surface and more 3D as if you could trip over them. 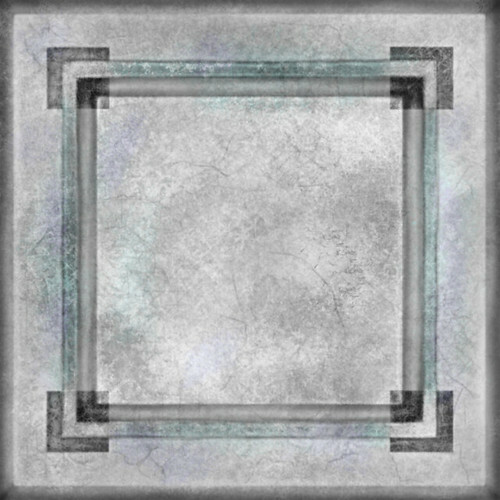 Maybe this was your intention, but for me it looks out of place relative to the many other tile sets that you have created. Not hating by any means, though! Nonetheless, just seeing these updates makes my day... and I haven't even gotten around to playing it yet to look even more closely. Hello! I recently have started emulating some old games again and stumbled upon this texture pack so I thought I would give it a whirl! I must say I am very impressed an believe this to be the highest quality texture pack for MM I could find. Unfortunately I am experiencing some crashing however, and was not sure if anyone knew of a solution. I am using Mupen64Plus FZ to emulate on my Moto z3. Game runs perfectly until I use the texture pack, then it runs very well until I transition to another area of the map, the day/night transition occurs, or occasionally just crashes/screen turns black randomly. I'd really love to continue using this texture pack to experience MM. Any insight you can provide would be very much appreciated! Also, I am using the GlideN64 plugin to run this. Thanks in advance! I too would love to see an OOT version. Where to I donate? Is all of this just a hobby, or are you a paid graphics artist as well? While high quality like all of your work, the inner square is such that it looks less like a flat surface and more 3D as if you could trip over them. Game runs perfectly until I use the texture pack, then it runs very well until I transition to another area of the map, the day/night transition occurs, or occasionally just crashes/screen turns black randomly. If it only crashes with the pack active then it's usually a memory issue. I looked it up and I think your device has 4GB of RAM? The pack will only use 1GB when "compress texture cache is enabled," make sure that option is checked. Are you using the regular pack or the HTC cache version? Try switching from one to the other and see if that changes anything. Last edited by Nerrel; December 25th, 2018 at 19:10. I have two gripes so far though. 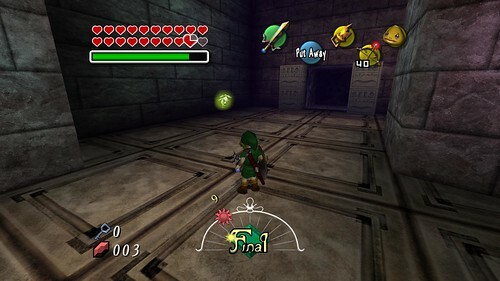 The ground in the area where Link falls right at the start, before he's turned into a Deku Scrub. It just looked a bit off compared to the rest of the area. I think it had too much detail compared to the walls. And Deku Link's hair is too finely detailed which harshly contrasts how few polygons make it up. Also his cap seems a bit lacking, but I don't mind it at all. Everything else is near perfect and I played up until the swamp last night. Hello Nerrel, I just discovered this thread and I have to say that your work is amazing. I have a question for you. I have tried the textures on the European version and the non-English graphics such as French or Spanish are not textured. Is there any future plan to texture these graphics in the future? Noticed a very minor graphical glitch with the clock, when running or doing any action which causes the clock to become transparent the little dot can be seen through the diamond in the center. I was able to fix this just by editing the texture in question and erasing the dot, as I don't think it's actually supposed to be seen at any point in the game anyway, may have been used as an alignment marker of some kind, or just an oversight from the developers at the time. I assumed as much on what the texture would really look like, but what odd optical illusion it creates! Thanks for the feedback. 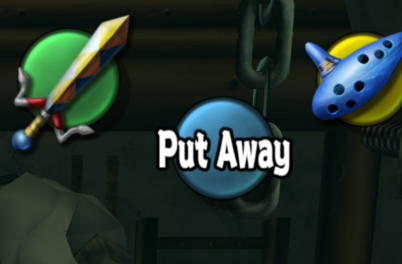 Deku Link's textures still aren't really done, and the hat isn't textured at all yet. I may have to wait to see if I can do model edits before finalizing him because the mapping on his hair is so bad. The intro segment is also going to have a lot of textures replaced on the second pass. I'm not going to be able to provide those textures since I only have the US ROM but the Dolphin pack does have textures for several languages, I think that's something that's being worked on right now in fact. It wouldn't be too hard to add those textures to the project64 version if the filenames were changed. I've been replacing the HUD piece by piece and that frame will be redrawn at some point. The dot is there in the original texture and doesn't really seem to serve a purpose, so I'll leave it out on the next version. Edit: I got it working now, but the Text in the Menus like in the Item Screen "Kokiri-Sword" still got the old textures. And the letters ä ö ü and ß are also the old textures. Anything i can do to fix this? Last edited by krypton; January 21st, 2019 at 23:22.